Ron “Canoe” Drummond was an author and surf pioneer whose massive 6’6 frame was eclipsed only by his passion for the Ocean. 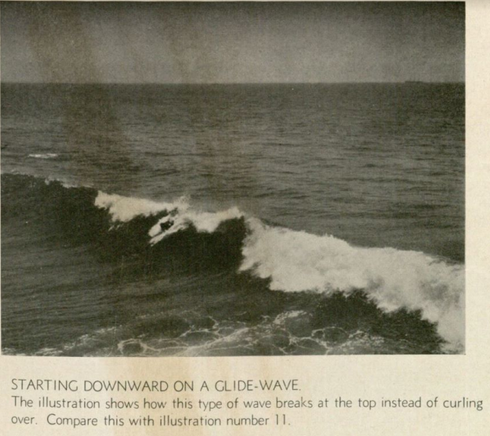 Drummond self-published The Art of Wave Riding at 24 years young. The year was 1931. The book was one of the first ever books written about riding waves and definitely the first written about bodysurfing. Drummond published a mere 200 copies of the 26-page artistic work. When you read Drummond’s work you may notice he fails to mention swimming fins, but that is because Owen Churchill wouldn’t submit his patent for another 9 years. By Drummond’s own admission, most wave riders of the time were athletically inclined and paid the price of time for their knowledge. He wanted to “increase a thousand fold the pleasure derived from surf bathing,” by providing hints at the best way to ride waves with your body. If you can get your hands on a copy, one of the first observations that will blow you away is the fact that there are actual photographs from Drummond’s time of himself and others bodysurfing. The primitive photographic technology coupled with the difficulty modern-day photographers have with capturing bodysurfing is enough to merit a long look from all bodysurfing enthusiasts. Drummond does his best to offer information to the casual surf bather and the seasoned surf swimmer alike. He describes two means of riding waves. The first is the position involving both hands out in front of your body with your head down in the water. The second and more advanced was to keep your hands at your side in what we call the “Prone” position. This matches all of the documentation we have of bodysurfers in Ron’s day riding prone to the beach. Drummond artfully guides the reader through bodysurfing small and large surf using the swimming terminology of the day and soulful delivery. He goes on to detail all the little tips he’s collected like stiffening one’s body, no hesitation, and taking a deep breath both for comfort and added buoyancy. This book is the one of the rarest books in the surfing genre and therefore very expensive. In recent years they have sold within the range of $1200-$4200. To find one you’ll have to scour auction sites or get lucky in other used book marketplaces. Ron passed away in 1996, but he left bodysurfers with the most exquisite link to their heritage within the 26 pages of Ocean joy, The Art of Wave Riding.